The Dean T Fraser Blog: Ok, it's Affleck... But don't forget about Cavill! Ok, it's Affleck... 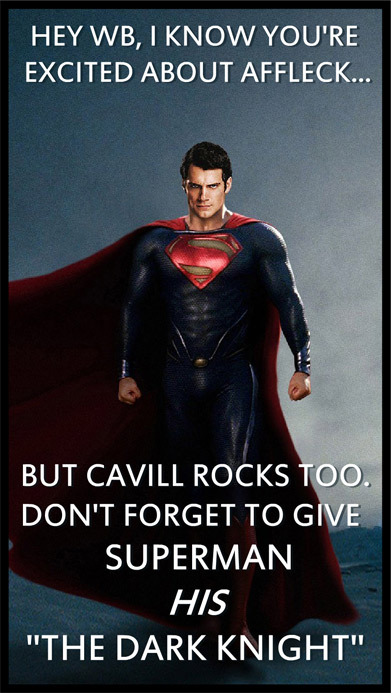 But don't forget about Cavill! Ok, after reading some articles, and having some time to think about it, I'm feeling cautiously-but-curiously-optimistic on the casting of Affleck as Batman. When you think about it, Ben Affleck is likely to have a lot of input as far as the direction of this Batman/Superman film, and after The Town and Argo, he's proven himself to not be a slouch in that area. Also, Affleck will add some star power to the movie. If the reports are true, he has signed up for "multiple" films, which almost certainly includes solo Batman installments and a Justice League flick or two, which will give Batman some stability for a while.